Thursday morning, I traveled to Bernice, Louisiana. According to the city’s website, the area is known as the “big woods” for its large stands of huge virgin pine, which Captain C.C. Henderson planned to take advantage of by means of his Arkansas Southern Railroad, the first railway in the parish. 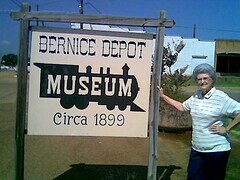 A railroad depot was built soon after, and today it has been restored and houses the Depot Museum with a collection of Bernice memorabilia. At the invitation of Violet, staff writer for the Bernice Banner, I spoke at the Bernice Business Club, a group of professionals who operate very much like a chamber of commerce. I spoke about writing, played my guitar and sang a few songs, and signed some books. They were a wonderful group of people and very interested in my writing about America’s Civil War. I also received a tentative invitation to perform at the annual Corney Creek festival in April and to speak to the Historical Society at a later time. I was able to meet so many interesting people, including Mayor Hicks, and Mr. Miner Patton, former police chief and former mayor. 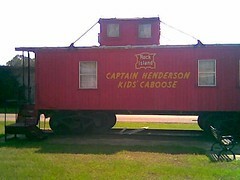 Before the luncheon, I stopped in at the Children’s museum (Bernice Depot Museum & Captain Henderson Kids’ Caboose) there. It is administered b y the Bernice Historical Society. The railroad depot was built about 1899 and served as a depot until 1984. There are many artifacts and memorabilia related to the railroad, to pioneers and original settlers, and to people of note who have lived in Bernice. Very interesting. 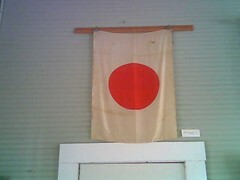 Here is a photo of Gladys Harkins, who runs the museum, followed by a flag of a WWII captured Japanese flag–the first I’ve ever seen. 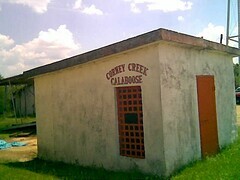 There is also a photo of the museum’s caboose that houses a wonderful collection of old children’s toys and the Corney Creek jail, that really used to be the city’s jail. I met a man in Bernice who had actually been arrested and who had spent the night there. Thursday night, I spoke at the Arlington, TX SCV camp meeting. I’ll have another post on that. Yesterday, (Friday, August 15) I spent with my father (now 81). It was his birthday. Today, I’ve a signing at the Sherman, TX Books-a-Million. I’ll return to Louisiana tomorrow and gear up and prepare syllabi for my college classes. I’ve got one at ULM and three at Delta, Monday-Wednesday. More in my next post.